FAQ – How Do I Get Freebies & Free Samples Online? Are you confused about how to get free samples and how WomanFreebies works? Read through this quick guide that will help you to receive the all best samples available. Think of us as your search engine for free stuff! We connect our readers with the most exciting sweepstakes, coupons and free samples available on the web. We don’t send out anything directly, so make sure you sign up for every offer that interests you! When you see a free sample that you would like, click the link at the bottom of our blog post. It’ll usually say “Get Your Free Sample” or something along those lines. Clicking that link will take you to an external site with a form. Just fill out that form and submit it, and in the next eight weeks you can expect to find a free sample in your mail box. Let me take this moment to make sure you understand – just clicking LIKE or SHARE on Facebook will not get you a free sample. When I click on the link I always see a “page not found” message – why? Are you on mobile? Many free samples and sweepstakes are not open to mobile users. If you see “page not found” that is usually what has happened. All of our sweepstakes are now mobile friendly. If you are interested, click here & check them out. We recommend using a computer when requesting freebies whenever possible. Why do I need to give my credit card information? You don’t. NEVER give out your credit card information. All of the free samples we share never require your credit card information. Sometimes you will get a free month trial (like Netflix) where you will need to give your details. We will explicitly tell you if that is the case. Why do I have to register to receive a free sample? You do NOT have to register with WomanFreebies.com. We have no login or password requirement. We do have a newsletter you can sign up for to see the latest and greatest, but it is not a requirement. Brands often ask for your address because they need to know where to send your free sample. It’s always different companies sending out free samples, so that means unfortunately you have to fill out a form each time. By the way, sometimes brands ask you to answer a few questions before you sign up; this is because they want to know how they can improve their products to better suit your needs. I don’t have a printer. Can I still use your coupons? Lots of our coupons don’t need to be printed out! Saving Star coupons are a great example of this. For the other coupons that do require a printer, I recommend stopping by your local library or print shop. You can get coupons for pennies a piece; that’s cheaper than most clipping services! Why is this freebie only available in certain states? Sometimes companies want to test their product in a small geographic area before they launch it nationwide. Don’t worry though, we are always looking for great new offers and there are bound to be many similar freebies available in your neighbourhood soon. It says “there are no more freebies available”; when will there be more? Unfortunately, lots of people want free stuff! That means that popular freebies often run out quickly. Depending on the sample, there may be more released the next day, but this it not always the case. Make sure you check your email first thing in the morning to ensure that you are among the first to hear about a free sample. Also, check our home page often because we blog about free samples all day long. Is it WomanFreebies.com that sends the free samples and coupons? No, WomanFreebies is like a search engine for free samples, we don’t actually send them out ourselves, we just find them and share them. I can’t enter my phone number, why? Try adding a space or dashes in your phone number; each form is a bit different. Will my inbox be full of spam? I find that when I give my email out, I am only submitting it to brands I would like to be contacted by. They usually give their followers first crack at the samples and sweepstakes. 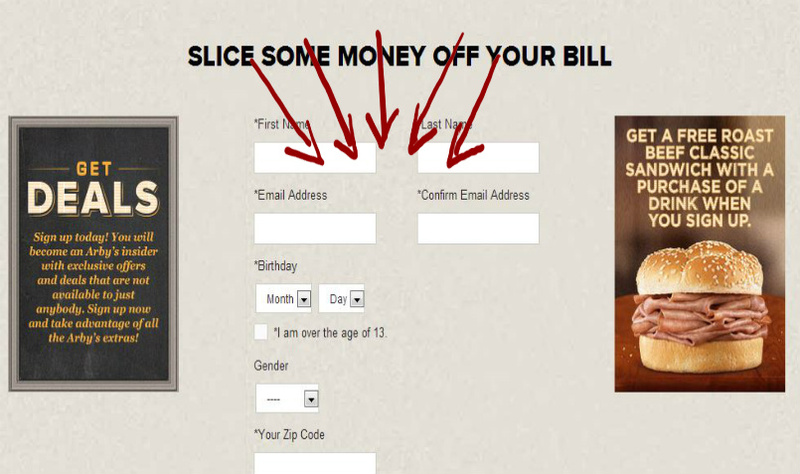 If you are concerned about giving out your email I would suggest that you create an address that you will use exclusively for sweepstakes, coupon-ing, samples etc. Also remember to look for the boxes that say ‘please click here if you would prefer not to receive the latest offers’. I clicked on a free sample link and it’s taking me to a different offer / error page, why? If the brand’s site is experiencing technical difficulties, you may be directed to an error message. We do our very best to re-direct you to a similar freebie. In the case that you get a blank page, feel free to post a comment letting us know or try again later. 1. On Facebook you come across this post in your news feed. 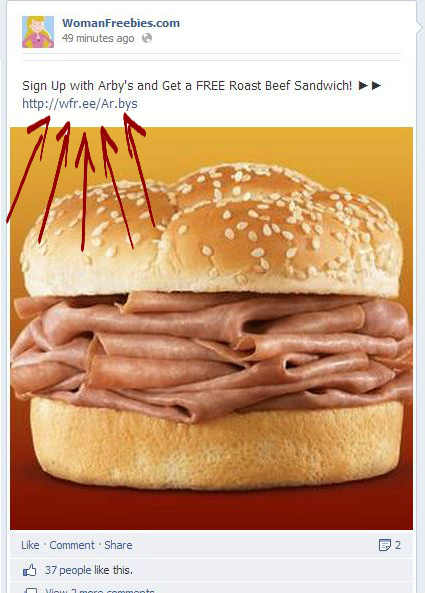 You want to take advantage of the free Roast Beef Sandwich. You would click on the link. 2. 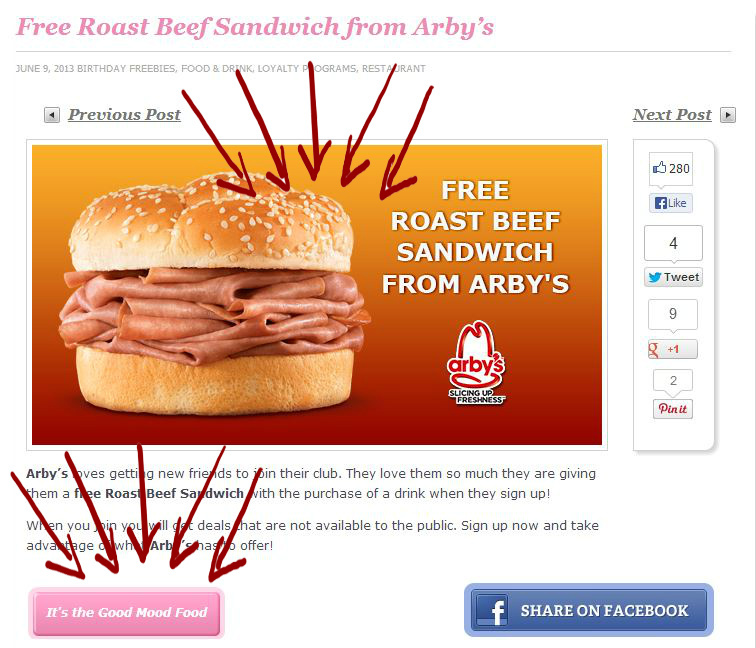 After you click on the link a new window or tab will pop up and bring you to our blog post, about the free Roast Beef Sandwich. Click on the image or the pink bar at the bottom of the post. 3. Doing the last steps will take you to the entry page – where you submit your information and get your freebie. Simple as that. Now you know what to do – go ahead and get started! Any questions we didn’t answer? Contact us by email!